Indians have the most ancient, well documented and well preserved (up to an extent) culture on the planet. Actually, since so many invasions happen on the land, a large segment of the same was lost. A lot of libraries are burnt, a large number of scriptures are tarnished, a large number of monuments are broken, and so many more atrocities took place over the period of the time. All these attributes are known. But, what is talked comparatively less is the systematic destroying of culture done by the invaders. The way the citizens are brainwashed to consider the fair (in color) people better than them, was the root cause of the same. Gradually, their literature, culture, food habits, clothing, the way of living,… everything was blindly accepted by the natives. When you lose your self-esteem and start considering yourselves less significant than the others, the problem starts. And, thus, over the period, the kids started growing up studying in convent schools and hearing the tells from the foreign land. No, there is nothing wrong in accepting anything good from anywhere and from anyone. The problem is not recognizing the better things you already possess. There is nothing wrong in knowing the story of Romeo and Juliet or Lord of the Rings or Harry Potter or Game of Thrones or Illiad; but not at cost of the stories of Bhagat Singh, Rani Lakshmibai, Lord Rama, Lord Shiva, Mahatma Gandhi, Nachiketa, Mahatma Gandhi and others. A few years ago, Anant Pai, saw this scenario and in order to educate the growing generation, a majority of which is deprived of hearing moral and ethical bed-time stories from grandparents; and he thought to come up with comics type books exploring these stories in an interesting way. Probably it will help the kids connect to the roots. 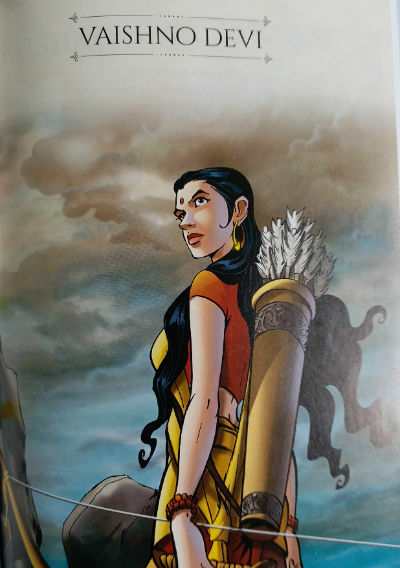 And thus came the concept of Amar Chitra Katha to existence. Since many years, kids and adults read it alike and showered praise for the same. These stories are definitely worth reading and it is depicted in quite an interesting way. As you can see, the cover page is decent, interesting and informative. And, at the same time, it is interactive too. Let us take a bird’s eye view of all the stories before sharing my views and reviews for this collection. I will try to make this entire review article spoiler free as much as possible, but please read with a consent that some of them are inevitable. Tirupati is the richest temple in the world. It is situated in the mountain range of Tirumala. People stand for hours in line to get just a glimpse of the Tirupati Balaji idol. Tirupati is a kind of unique temple in a sense that the devotees offer their hair to the temple. The temple is one of the biggest sources of hairs for the wig makers. Even the female devotees don’t hesitate to offer their hairs here! So, it is almost obvious to see a devotee in his bold status after coming back from Tirupati. 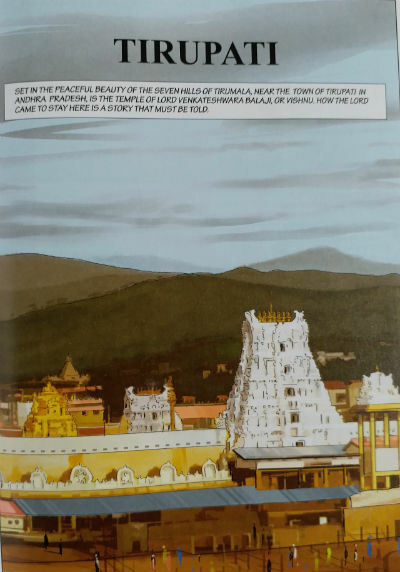 The tale of Tirupati stars in very ancient times and the author tried weaving many stories here. The weaving of the stories could have been better as when one story starts from the another repeatedly, it is easy for (the target) reader to lose a track. The story starts from the time just after Treta Yuga. The story starts from the time when Lord Vishnu fulfilled his duty as Lord Krishna and the incarnation aka avatar left the mortal body and went back to Vaikuntha, his permanent abode. Actually, the scriptwriter seems to have missed mentioning a point that with the death of Lord Krishna the Kaliyuga has started, so the story belongs to Kaliyuga itself. Aruna Balakrishna Singh, the scriptwriter, otherwise tried to make the story interesting. The story talks about a fire-sacrifice (aka Yagna / Yajna / Yagya) performed by a group of sage. There created a dilemma by someone that whom the offering of the sacrifice should go?! And the possible way out of the same is to approach sage Bhrigu (does he happened to live during Kaliyuga?) and ask for his opinion. Stronghead sage Bhrigu decided to visit the holy trinity (Brahma, Vishnu, and Mahesh) in order to find the worthiest of them (for the offerings of the fire-sacrifice). His meeting with Brahma and Mahesh didn’t well fine, and he came back from their respective places by cursing them. But, when he went to meet Vishnu, he was treated pretty well. As the last test, he kicked Vishnu in his chest and Vishnu didn’t lose his cool or composure at all. This makes Bhrigu come to a conclusion that Lord Vishnu is worthiest of them and should receive the offerings of the sacrifice. This incident, however, didn’t go well with Goddess Laxmi! Why? Well, you need to read the answer and explore the chain of events happened from that point forward. The illustration and cover (both by Sundara Moorthy) are really attractive and detailed. It makes you engross it the story quite easily and makes you forget the script mistakes. Actually, the problem could be the fact that there are various versions of the same mythological tale are found. And, the scriptwriter often needs to borrow some stuff from each of them or might need to stick to the one he/she is convinced about. So, Aruna’s job was rather more challenging, and she tried remaining honest to her work. I, however, found some let downs there, as mentioned above. Anil Kumar M. is responsible for the Design and Layout and he seems to be in complete control of the stuff and you can easily find it linked with the script pretty well. Adarsh Achari’s color section is quite interesting and it adds to the “attraction” part of the book. Rina Puri, the editor seems had tried editing the script well. Though, she may also need to do better work here. 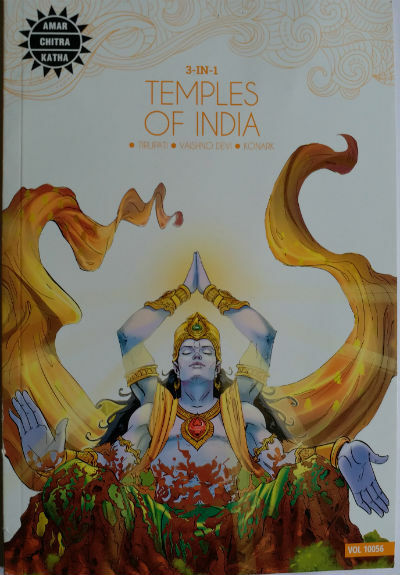 It is an interesting tale which talks more about mythological stuff than the historical incidents, apart from some which are related to the process of building the temple. I was curious to explore the story which explains the “hair offering” and it’s significance at this temple. I am disappointed as I am unable to find it. Vaishno Devi is a very famous temple situated in the hills of Himalaya near Jammu. The journey to the temple is a little tough. And due to the rise of unrest in the state of Jammu and Kashmir, it becomes tougher. It is probably the most famous Indian Goddess temple. A large number of people came to know about this temple and have visited it on TV due to T-Series founder Gulshan Kumar’s various videos on the same. Of course, it is known much, otherwise also. The script of this story is written by Aruna Balakrishna Singh. She did a remarkable job here. Again there are many folklore and version of the stories might be available to her to chose from. The story starts from Treta Yuga. It was the tough time for Deva running those days. Actually, the Danavas and their troops were very powerful. And, they were able to practically overpower the Devas! When the divine trinity meet to discuss the scenario upon the request of defeated Devas, they all agree that the power the Danavas gain is due to the boons given to them by the holy trinity only. And, as it is said in Hindu mythology, the Devas are bound by the Mantras. So whenever someone does ultimate penance, they need to appear and give them the boon they are eligible for (few exceptions there, like immortality). And, they cannot do anything about that. That is the main reasons we found Indra going after the one who is doing ultimate penance, to break it by hook or crook! Anyway, as Brahma, Vishnu and Mahesh are not seeing any conclusion approaching them soon, they were thinking over the solution. So, Sarasvati, Lakshmi, and Parvati met and decided to do something to help their respective husbands and get the Devas out from this tricky situation. They create a Goddess by combining their powers together and named her Trikuta. She eventually was able to defeat demons! But, it is the story of Trikuta, how is it linked it with the legend of Vaishno Devi? Well, you need to read the rest of the story (which actually has many threads like the previous story) to know. The cover page showing a warrior lady (not in the divine – Goddess – form) makes the cover page interesting. The powerful personality and courageous stand of the lady explores an interesting part of the story which we didn’t talk above. Durgesh Velhal’s illustrations are really admirable. He designed the cover (for the story) as well. Adarsh Achari, Anil Kumar M. & Subramanian supported him with colors and other stuff. And the entire team’s effort is visible in the book. The story has some traces in Ramayana and the time after. You will find it interesting to know about Adhkunwari legend. A map of various places associated with the legend adds to the positives of the story. I need to resist my temptation to include the map here :). Overall, a story which you will like to explore and you will get to know about the importance of various places en-route the temple of Vaishno Devi and the key points of the pilgrimage very well. 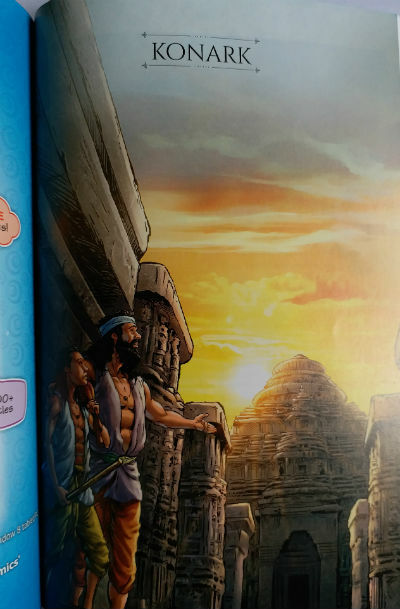 The third and final story explored in this “3 in 1” collection is of Konark. Konark is known for a fantastic sun-temple it possesses. One more Sun temple is situated in Modhera, Gujarat. But, let us talk about Konark and the Sun temple there. And, more importantly, various attributes of the story and how it is explored. This story is scripted by Nimmy Chacko. The exploration is quite interesting. Though this story also has more than one threads, it is more focused and gripping. It all starts with the legend of Narsimha Deva I. He was a brave warrior and a very ambitious king who fought in many battles. But, contrary to that, he is a humble and generous king. The happiness and safety of the citizens always come first for him. The Almighty doesn’t give everything to one. Or otherwise, a person may not need to remember the supreme power! Narsimha Deva I, was childless! So, he performed penance to the Sun god and ultimately was able to get a boon from him. He was eventually blessed with a son whom he named BhanuDeva. Bhanu is another name for Sun god, by the way. Feeling blessed, Narsimha Deva I decided to get a Sun Temple built. He was thinking about making a grand monument which can reflect the glory of the Sun. So he called in his minister and confidante, Sibi Santra. The challenging task for Sibi is to find a craftsman who can take the responsibility of building such a grand structure and can actually deliver. Of course, he will be helped by thousands of men. Finally, Sibi came across Bisu Mahara and he was mesmerized with his skills. Bisu was appointed as the craftsman and the next big thing was to find the proper location for this remarkable monument they are planning to build. How the things move forward from the point is the rest of the story, which I suggest you explore by reading it. You will come across the reference of Surya’s wives Sanjana and Chhaya, Lord Krishna, Jambuvati, Samba, Ashwini Kumaras, and others. The illustrations and cover by Arijit Dutta Chowdhury contain the grandeur require for the same. Prakash S. and C. Ramesh assisted them nicely with the colors which look amazing on the characters and objects both. Sivajith S. did a nice job in laying out the things. Reena Ittyerah Puri’s editing requires a mention for sure. The story moves ahead smoothly and the caricatures are worth viewing. The dialogs are small and effective. We can say the same for the narration. Overall, a nice attempt to explore one of the most remarkable temples in India. The story can indirectly help the readers to understand the importance of Nature and especially the Sun. The Sun’s “healing power” can prove to be a metaphor for Vitamin-D it gives in addition to light and energy. As I’ve talked about various attributes of the story along with each of them, I don’t repeat them here. These legends are not only meant for spiritual awakening. It is all about knowing the country and culture. It also explores the importance of nature and helps us understand (in direct/indirect) way about why our culture considers Water, Trees, Mountains, Land, Moon, Sun, Air, Fire, and other natural stuff as the Gods! You may find it a little pricey, but it is definitely worth reading collection. It is also worth to note that each of these 3 stories is available as an individual book(s) also. The individual stories also have their Kindle EBook version available. We got the review copy from the Amar Chitra Katha team, but the reviews are unbiased and uninfluenced as always. Very nicely reviewed. The book seems very interesting.